We know that for most dog owners being able to bring your dog on holiday is important. We have a dog ourselves and understand the trouble that many people face when trying to find suitable welcoming accommodation for a holiday that also accepts doggy guests. 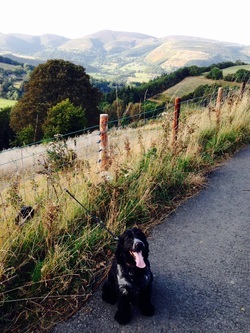 Llangollen is a great area for dog holidays and we welcome a well behaved dog in both Woodpecker and Owl Cottages; subject to our simple doggy rules that ensure that your holiday is enjoyable for both you, your dog and our future guests who may not want to bring along any four legged friends. Dogs are not allowed onto furniture inside the cottages. Dogs are not to be allowed upstairs in the cottages. Please request a stair gate at the time of booking if you think your dog might need help with this rule! If dogs are to be left alone in a cottage they must be in a crate. We have one medium sized dog crate available, please specify at the time of booking. If this is not suitable please bring along your own if you wish to leave your pet alone in the cottage. We would also request that the length of time that dogs are left unattended is kept to an absolute minimum. Any dog mess in the outside areas must be cleared up prior to departure. Dogs must be kept on leads when exploring the local area surrounding the cottages and farm. Our neighbours keep all types of livestock in the fields adjacent to your holiday cottage and you must respect this. There is an area in our paddock where you can let your dog off the lead for exercise; but they must not be left unattended. If specified when booking we can provide doggy towels for you to help keep your pets paws clean when entering the cottages. Your pet is likely to meet Blue, our Spaniel, so any doggy guests must be friendly around other dogs. Finally, we expect that the cottages are left a clean undamaged condition both inside and out.